Foundations of Quantum Programming discusses how new programming methodologies and technologies developed for current computers can be extended to exploit the unique power of quantum computers, which promise dramatic advantages in processing speed over currently available computer systems. Governments and industries around the globe are now investing vast amounts of money with the expectation of building practical quantum computers. 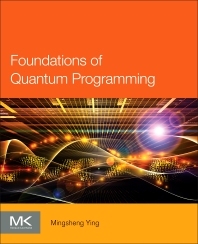 Drawing upon years of experience and research in quantum computing research and using numerous examples and illustrations, Mingsheng Ying has created a very useful reference on quantum programming languages and important tools and techniques required for quantum programming, making the book a valuable resource for academics, researchers, and developers. Mingsheng Ying (h-index: 34) is currently a Distinguished Professor at the University of Technology Sydney (UTS) and Research Director of the Center for Quantum Computation and Intelligent Systems, at UTS. He was the Cheung Kong Chair Professor, in the Department of Computer Science and the Scientific Director of the National Key Laboratory of Intelligent Technology and Systems at Tsinghua University. His research interests are quantum computation and quantum information, programming language theory and artificial intelligence. In 2008 he received The National Science and Technology Award for contributions in computer science from China. He is an Associate Editor of Artificial Intelligence (Elsevier) and he has published more than 100 papers in top international journals and conferences such as ACM Transactions on Programming Languages and Systems, Artificial Intelligence, IEEE Transactions on Information Theory, IEEE Transactions on Software Engineering, Information and Computation, Journal of Computer and System Sciences, Physical Review Letters, POPL, CONCUR, IJCAI. He is also the author of the book Topology in Process Calculus - Approximate Correctness and Infinite Evolution of Concurrent Programs (Springer 2001).